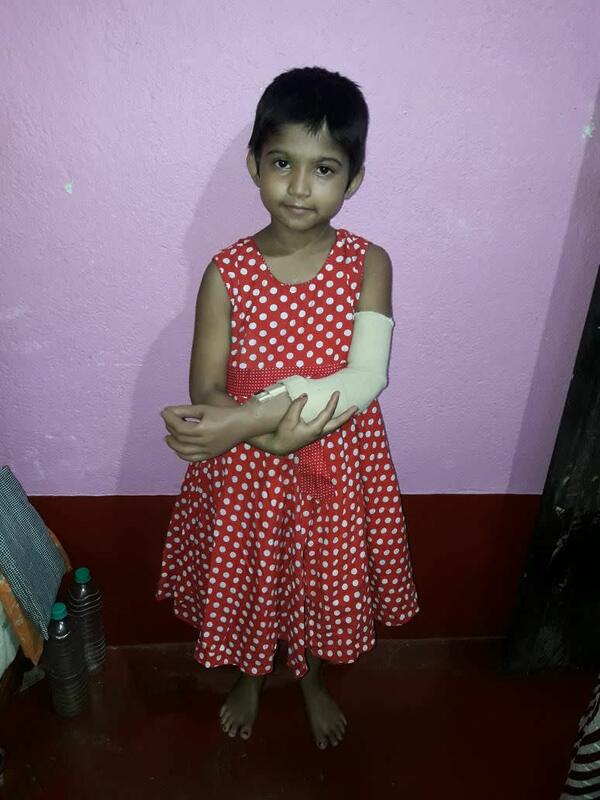 “When are you going to get my new hand” a question from a daughter to a helpless father….. This tragic incident occurred on 20th April 2018. This year Panchayat (rural local bodies) election in the West Bengal claimed 13 lives along with violent political clashes. As the political violence spread across the state, Sambhu Halder’s family also did not escaped. On the morning of the fateful day, during her daily routine task of plucking flower, assuming it to be a toy, a bomb was picked up by his daughter Poulami. On seeing her with the bomb in hand, her father and grandfather cried aloud “throw it immediately.” Poulami at once threw it, but within a second there was an explosion. A blinding light and a terrible sound. Unconscious in a pool of blood lay little Poulami. 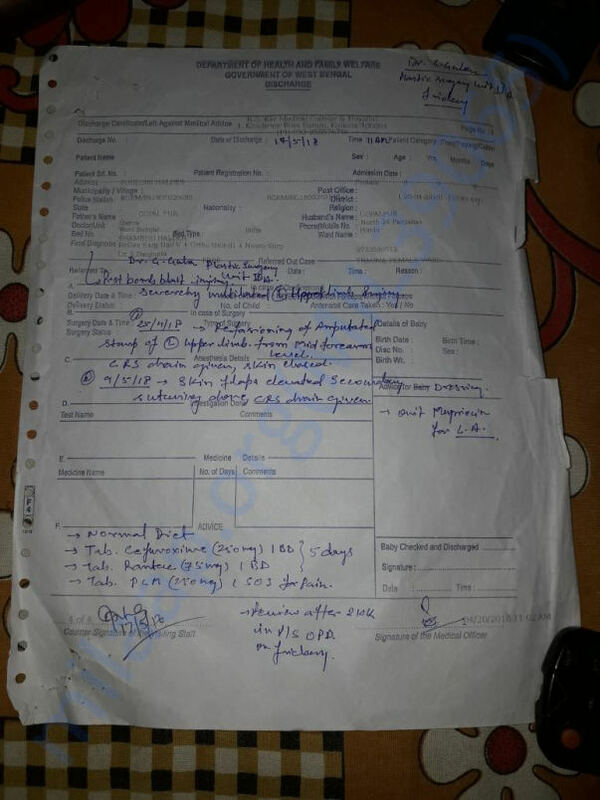 Even after six weeks of the incident, Police is clueless on the source of the bombs. Political parties continue the allegation and counter allegation games. Poulami lives at Goplapur village, near Haroa, North 24 Paraganas district in West Bengal. She studies in the 3rd standard and her elder sister is in the 8th standard. 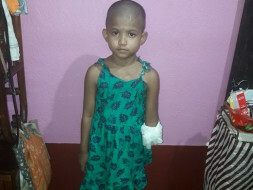 Her father Sambhu is sick with neuro problem for last one year and unable to run her vegetable shop. Her mother Deepali Halder runs the family by tailoring. Could not able to answer daughter’s question her father leaves to shed tears. 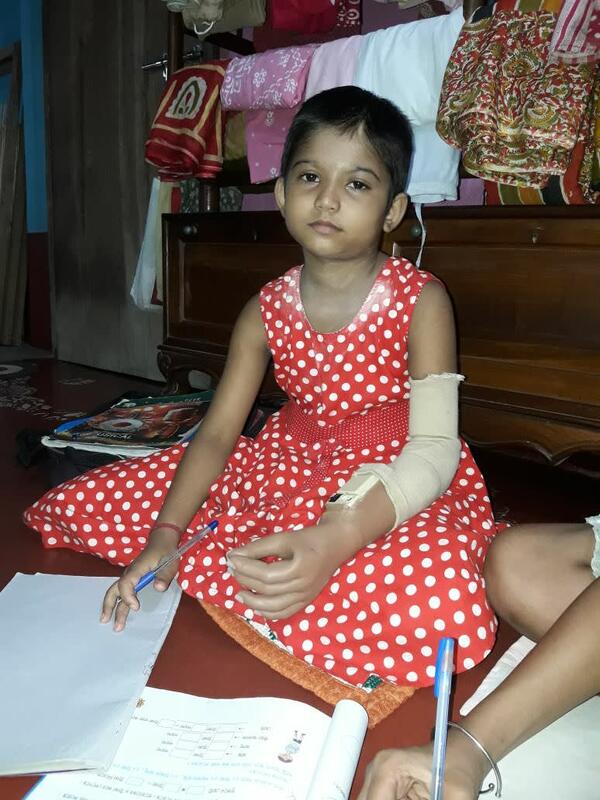 Sambhu narrates when in hospital Poulami used to cry he would console her saying, “I would get a new hand for you.” However, Sambhu becomes helpless after knowing the cost of prosthetic or artificial hand’s costs. Searching her father Poulami came to the room and said, “Baba…when will you buy the new hand for me” Unable to meet her daughter’s eye, Sambhu flee in hurry. So, will Poulami be deprived of an artificial hand because her father is sick with a neuro problem? Does she have to adopt hiding her left hand because her mother is economically weak? Or she would continue lifelong being a victim of the political violence? Can we afford to paint a world of despair to a 7 years old child? Poulami’s new hand: They have gone to Endolite based on Govt. hospital’s Dr’s recommendation. 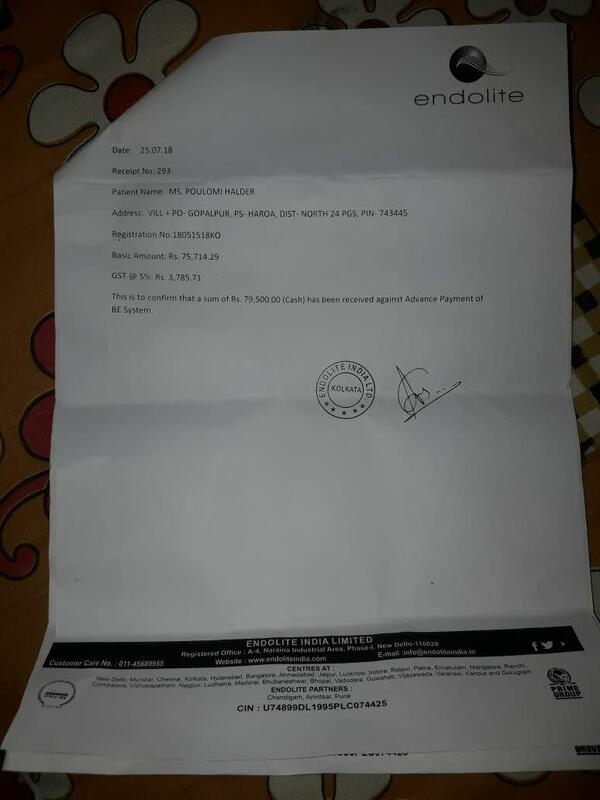 This prosthetic company is also endorsed by couple of medical practitioner I spoke to in Chennai. The new hand will last for another 10 years. Every 3 years the fingers will be replaced. Movable fingers would be 3 out of the 5. At the age of 18 as she becomes adult and growth stabilizes, she will need another prosthetic hand. 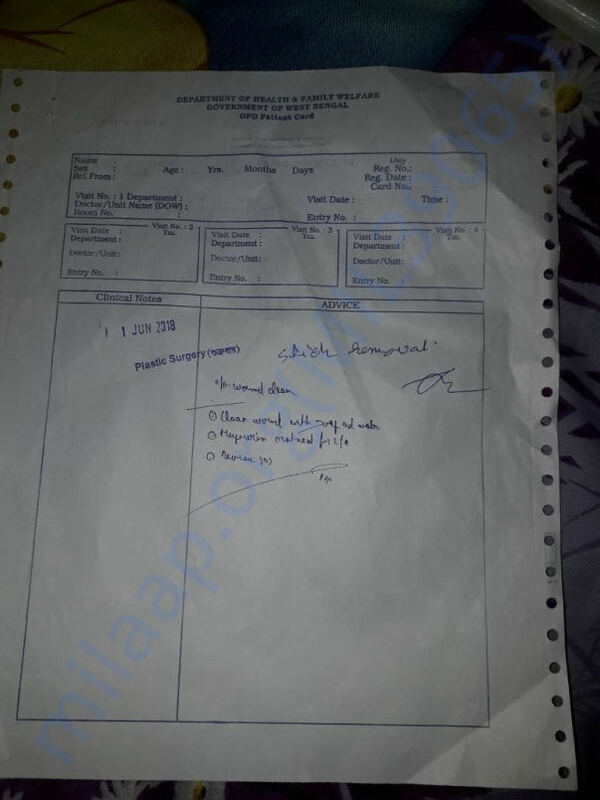 Have a look on the attached documents too. The Cost: Overall expenses including the finger replacement in the next 10 years would be a total of Rs. 2 lakhs 85 thousand. The family have ordered the hand and in need of the amount within the next 30 days. The Need: The family has manged to gather and collect Rs. 1 lakh 25 thousand. There have been many promises from rich and resourceful men of the society but yet to materialize. They still need Rs. 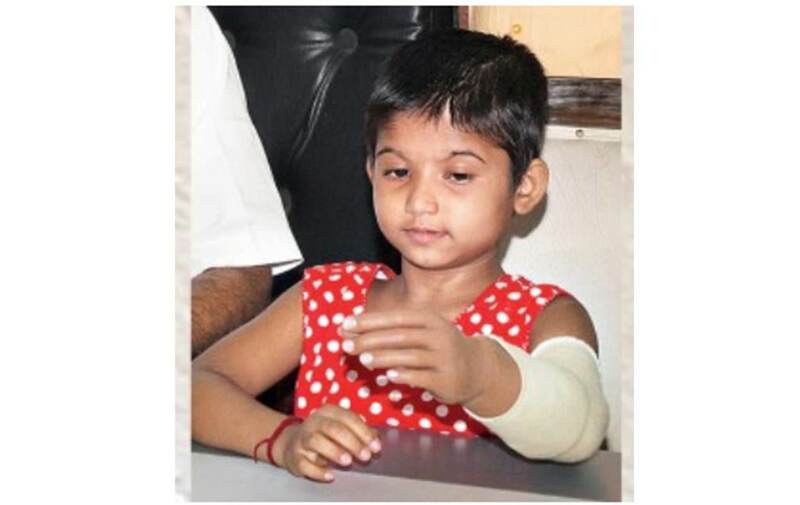 1 lakh 60 thousand to gift this kid her hand back. I have done my bit. 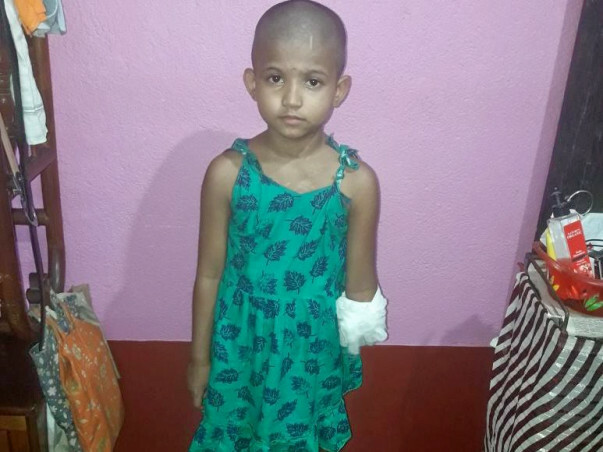 However, it is not enough and hence I request you to please consider gifting this kid her hand back by your benevolent help. You may transfer the amount to her parent’s account as mentioned below. If you know Bengali, you can directly speak with Poulami’s parent at 70290 20898. However, for any further queries and confirmation of credit of your donation – please feel free to reach out to me. Let’s show Poulami that this world is full of hope, love and smiles. Just to re-introduce myself I was the fund raiser for this campaign supported by YOU for Poulami Halder of Haroa in West Bengal, India. Thanks to you, she is doing fine and pretty much back to her normal life - school, drawing, outdoor games, etc. She is now used to her new hand. Though she is currently facing some itching and getting pimples in this scotching summer sometimes - in the areas where the new hand touches her skin. I am planning to visit Poulami and her family at her home on Tuesday, May 21st. If you have any advise or guidance for her, please let me know. If needed, I can take printout of your customised message and handover to her. Any other instruction to me - feel free to pass it on. Post my visit - hopefully with some pics I will provide you an update. Requesting your wishes and blessings. A week back, Poulami’s mother called me and informed that the surgery went well. 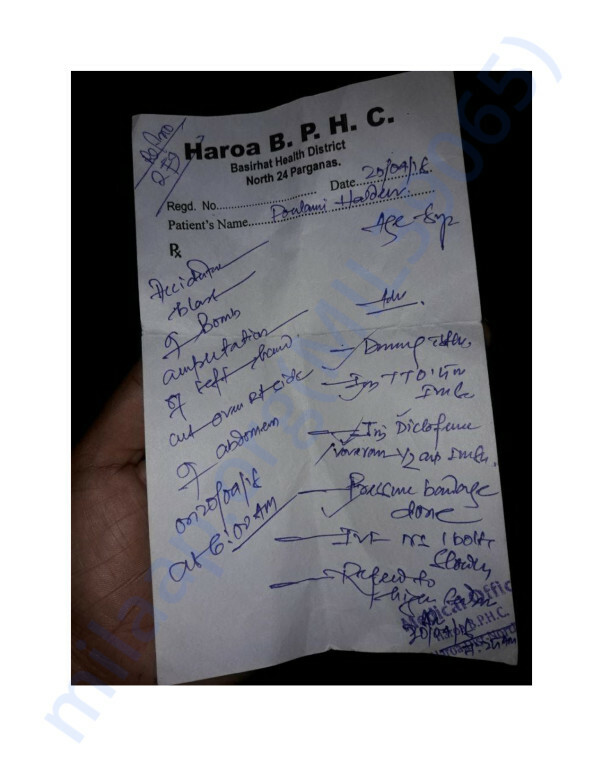 A day before the surgery – end of July, her purse was stolen in Sealdah railway station. As her mobile was lost, she was not reachable. Her new mobile no. is 9051 864 477. Total expenses = Rs. 2,84,890. 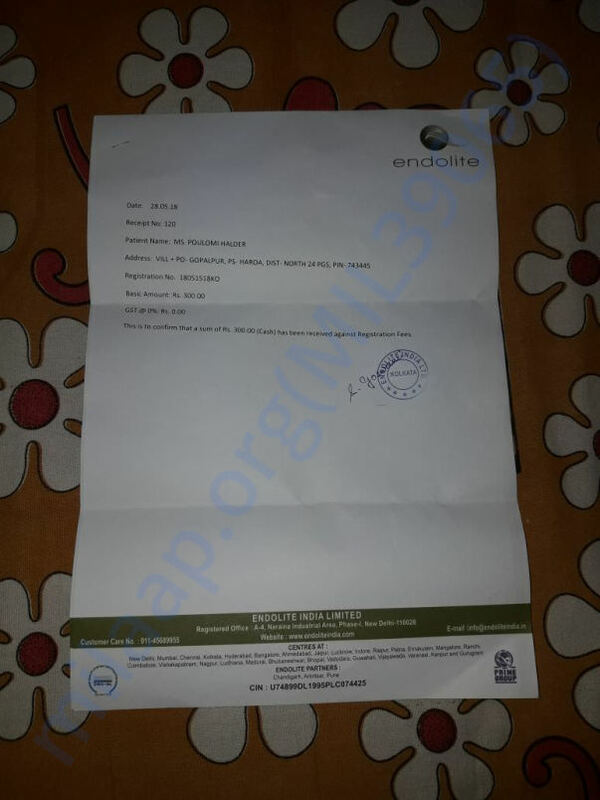 In the last moment it seems Endolite gave few% discount and then with the newspaper articles there were other kind donation. Poulami’s mother said the total amount will be around Rs. 1 lakh which will be kept in a FD for the next hand. This hand will last 10 years only. At the age of 18, she will be requiring another hand that will last life time. It will cost Rs. 16 lakhs. 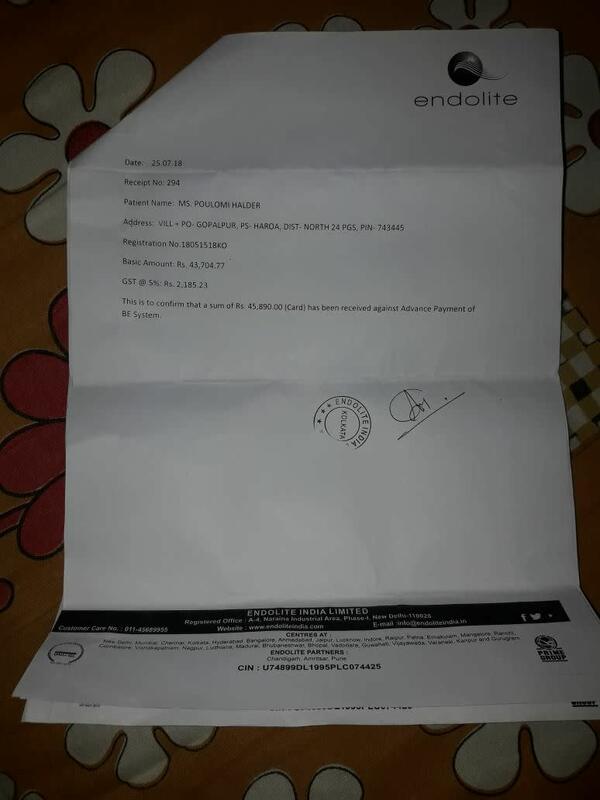 As per Poulami's mother - the July 26th article of Anandabazar is fabricated and had lot of facts that are not true. The reality for the family remains harsh and there was no benefits extended - they were used more as a propaganda of a political party. Lastly, Poulami's mother being a rural woman without internet connectivity cannot thank each one of you personally. But she and her family will be ever grateful to each one of you for lifetime. She invited all of you to visit her house and meet our little Poulami. 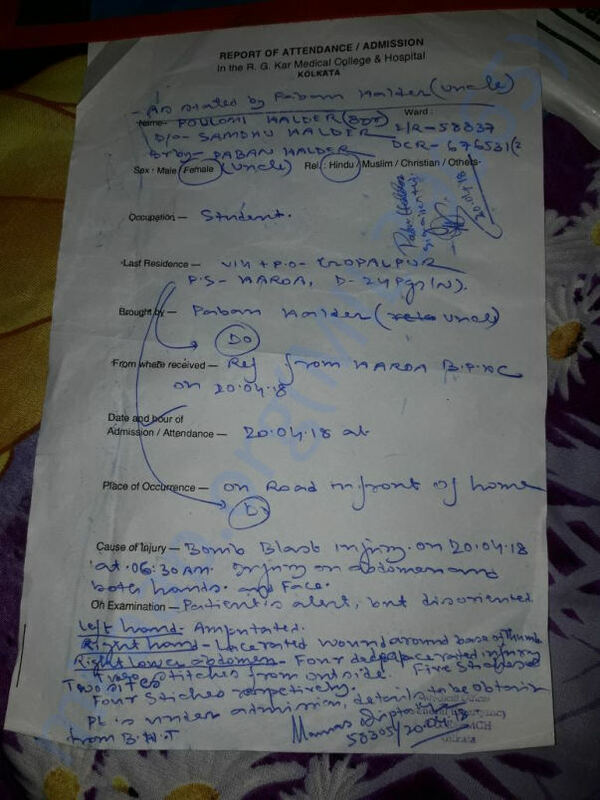 One of her sentence stuck me "I am unlucky that I do not have the means to take care of my injured daughter, but I am lucky that God came in the form of such well-wishers to help my child." Seems the local MLA and politicians are too busy with the family to take the credits. :-) The article talks about local MLA arranging Rs. 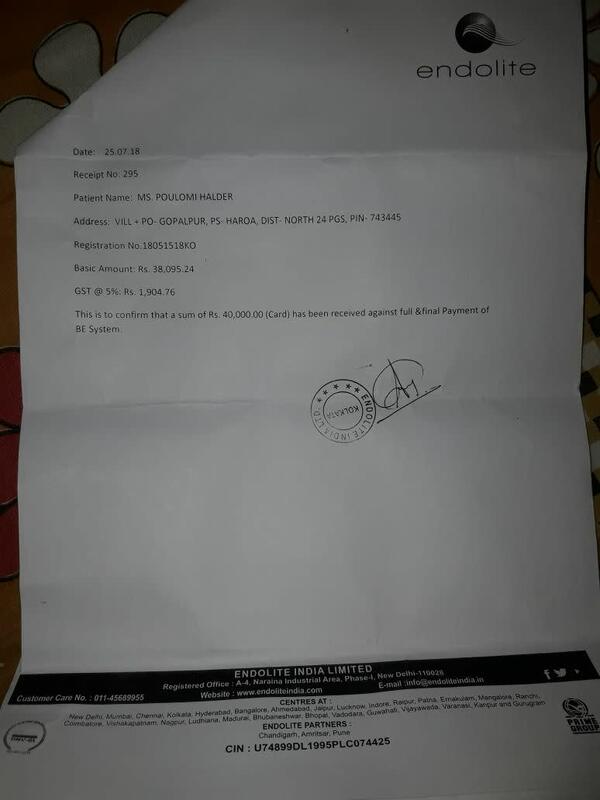 3 lakhs for the kid !! When all of us were spreading this news and fundraising for last six weeks - the MLA an ex-footballer was busy watching world cup football matches in Russia. Further, even last week Poulami's mother had mentioned that overall she managed to receive Rs. 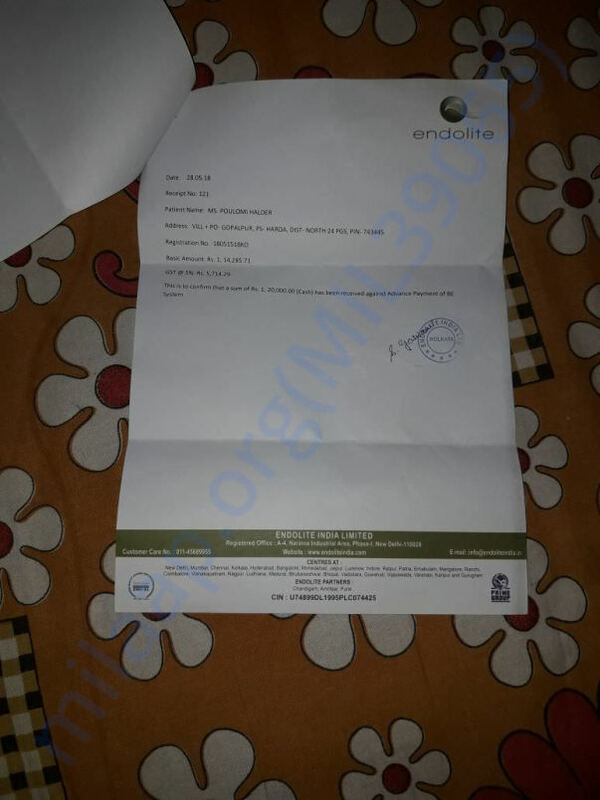 1.9 lakhs and then the rest were savings and interest free loans from relatives. Anyways, our job of bringing smile to this kid is done and all of us should be happy. I will keep trying to reach out to Poulami's family and update you all after that. This is my 2nd instalment. I just spoke to Poulami's mother over the phone. An exceptionally strong woman. I hope we reach our target amount. I am not on FB, but have sent the link to this site to all my Bengali friends.